The National Girls Senior Students competition continues from last term. 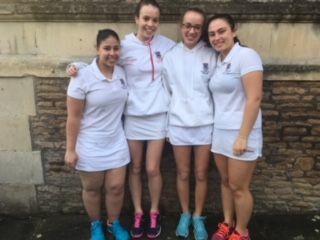 Noa Gispan/ Neve Gad/ Flora McHattie and Ella Koupparis won the county area finals before Christmas which meant they progressed into the Regional finals. The girls had to play a tricky team (in more ways than one!!!) travelling up from Torquay Grammar. Flora and Ella won their doubles and 2 singles matches whilst Noa and Neve were still playing their first round singles matches. Knowing that we only needed one more match to win the tie overall, Neve narrowly lost her singles which meant that we were holding out for one more win. Noa eventually came through a very tight match winning 6- 3! To top off a great win overall, Noa and Neve won their doubles also and therefore winning the tie 5 matches to 1. The girls are now in the National Finals which will be held next month in Bolton Tennis Arena. Many many congratulations girls and good luck for the National finals.